The MolE Ph.D. program will be separated into two focus areas, “CleanTech” (CT) and “BioTech,” (BT) and consists of core courses, elective courses, seminar courses, and research credits. A minimum of 63 research credits are required, yielding a minimum total credit count of 99. The core course sequence consists of three graduate-level courses, of which two (MolE I and MolE II) are mandatory for all MolE students, and one (MolE-CT or MolE-BT) is specific to the selected focus area. There is also a seminar (MolE-S) course that follows the student over three academic years (year 1-3). MolE-I: Molecular Engineering Principles covers molecular aspects of condensed organic materials, particularly molecular and collective interactions and resulting interfacial forces, entropic phenomena and condensation to systems of higher complexity. Includes the exploration of molecular system constraints and the molecular origin of resulting macroscale properties. Provides introduction into computer modeling. This course is offered jointly with ChemE. MolE-II: Advanced Molecular Engineering covers fundamentals of molecular recognition and design: thermodynamics, dynamics, and kinetics. Includes molecular design of macromolecules, recognition processes for current molecular engineering applications in biomedicine, and therapeutics based on cells. Offered jointly with BioE. MolE-CT: Organic Electronic and Photonic Materials/Polymers covers physical and material concepts determining properties of organic electronic and photonic materials. Discusses electronic structure, physico-chemical characterization, and device application. Includes introduction of electronic band structure of polymers, electrically conducting polymers; organic nonlinear optical electroluminescent materials; polymer optical fibers; tow-photon absorption materials for 3-D microfabrication. This course is offered jointly with MSE and Chemistry. MolE-BT: Synthetic Biosystem Engineering on the Molecular Scale studies mathematical modeling of transcription, translation, regulation, and metabolism in cell; computer aided design methods for synthetic biology; implementation of information processing, Boolean logic and feedback control laws with genetic regulatory networks; modularity, impedance matching and isolation in biochemical circuits; and parameter estimation methods. This course is offered jointly with EE, BioE, and CSE. MolE-S: The Molecular Engineering Seminar features weekly research presentations from national and international experts in Molecular Engineering CT and BT. It is offered jointly with the Nanotechnology and Molecular Engineering (NTME) seminar, and is supported and run by the MolES Institute. The core program is complemented through research experiences and elective courses. The MolE Ph.D. elective courses (18 total credits) are composed of “Outside of Focus Area Elective” (3 credits), “Free Electives” (6 credits), and “Research Facet Electives” (9 credits). An approved and regularly updated list is provided for research facet electives. 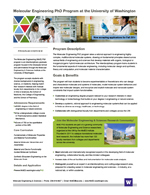 A CleanTech or BioTech related course that is from the opposite track as your own. For example, a BioTech student would choose a CleanTech course while a CleanTech student would choose a BioTech course. to conduct original, independent research based on a written report on the research completed and plans towards the General Exam. Non-thesis Master of Science (M.S.) in MolE at least one quarter prior to the General Exam. The non-thesis MolE M.S. entails written and oral reports, based on the 600 level research (35 credits), to the student’s Ph.D. supervisory committee. The supervisory committee evaluates the quality of the research and student’s ability to apply molecular engineering principles. All students are required to earn a MolE MS regardless of prior degrees. The Ph.D. final exam will comply with the exam requirements of the department. It is not feasible to set the total time to degree, but we expect most students to finish in less than five years. Adjust your research credits so you are registering for 11 to 18 total credits during the Autumn, Winter, and Spring quarters. Register for two credits during Summer Quarter. If you fail to meet one of the below milestones on time, you are subject to being placed on probation or dismissal from the program either via internal procedures, or via the Graduate School policy detailed in Memo 16. This includes securing research rotations, as well as securing a permanent lab placement. Participate fully in the research group selection and orientation process via establishment of a research rotation. Enrollment in 600 level research credits (see footnote). Credits are variable based on advisor recommendation. Participate fully in the research group selection and orientation process by continued research rotation/s and securing long term advisor. If a permanent research group slot and corresponding funding was not secured during Winter Quarter, secure a spot and funding by end of quarter. Research/Dissertation (600/800 level, see footnote). Credits are variable based on advisor recommendation. If you fail to meet one of the above milestones on time, you are subject to being placed on probation or dismissal from the program either via internal procedures, or via the Graduate School policy detailed in Memo 16. The GPC will consult with your Ph.D. committee to determine whether probationary status or dismissal is appropriate. Once you are on probation for a specified deficiency, you must return to normal status within one quarter. Otherwise, any program financial support commitment terminates.